One of my favorite outdoor methods is to cook food inside of food. It is a unique way of both cooking and flavoring foods. The outer food shields the inner food against the extreme heat and gives additional flavor. Select an orange with a thick peel, because it is easier to remove the fruit inside. Cut the orange in half. Ease your finger between the flesh and the peel of the orange. Slide your finger back and forth to detach the flesh from the peel, leaving an orange “cup.” A spoon may also help in separating the fruit from the skin. Eggs or muffins are foods that will cook nicely inside of the orange peel. For an egg, line the orange peel with a piece of foil and then put a little oil in the foil. Then break the egg into the foil-covered peel. Wrap the outside in foil and place on hot coals until the egg is cooked. For muffins I like to mix them in a zip-top bag and then squeeze the batter into the peel, leaving a little room for it to rise in the peel. Wrap the outside in foil and place on a hot coal and cook until done. This is one of my signature recipes and is wonderful for a large group. Each person makes his or her own, and a recipe serves four. Leave on the onion skin, but cut off the root at the bottom end of the onion so that removal of the center is easy. The removed center of the onion can be diced and combined with meat loaf ingredients or used later. In a 1-gallon plastic self-sealing bag, combine ground beef, egg, cracker crumbs, tomato sauce, salt, pepper and dry mustard. Mix ingredients by squeezing. Set aside. Cut onions in half horizontally and remove center part of onion, leaving a three-fourth-inch-thick shell. If you want to dice the center of the onion and add to meat, do so. Divide meat mixture into 4 portions and roll into balls. Place in the center of the 4 onion halves. Put onions back together. 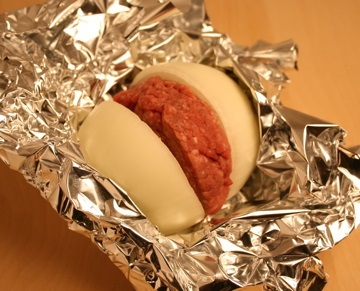 Wrap each onion in foil by placing the onion with the meat mixture in the center in the middle of the foil. Bring the side together cover the onion and mixture. Fold the foil in small fold until if is cover. Then flatten the foil on the side down and then roll them in sealing the onion inside the foil. Cook over a bed of hot coals for 15 to 20 minutes per side. Serves 4. Outdoor Special: Enjoying the great outdoors is one of the nicest benefits of the summer. If you want some great ideas to do with your family, church group, or friends, check out the special Dian has on her website at www.DianThomas.com. Roughing it Easy, Recipes for Roughing it Easy and a DVD on Dutch Oven cooking is on special for 40% off. Travel with Dian and see the world: Dian takes people to China, Peru, South Africa and Israel. If a cruise or other destination is on your agenda, drop her a note at info@dianthomas.com and share with her where you want to go. She will do her best to get you a great trip to that destination. Maybe she will take you there herself.